We are delighted to announce a 60th anniversary celebration of ’20 Million Miles to Earth’ at Queens Links Cineworld in Aberdeen, as part of our #Harryhausen100 celebrations. 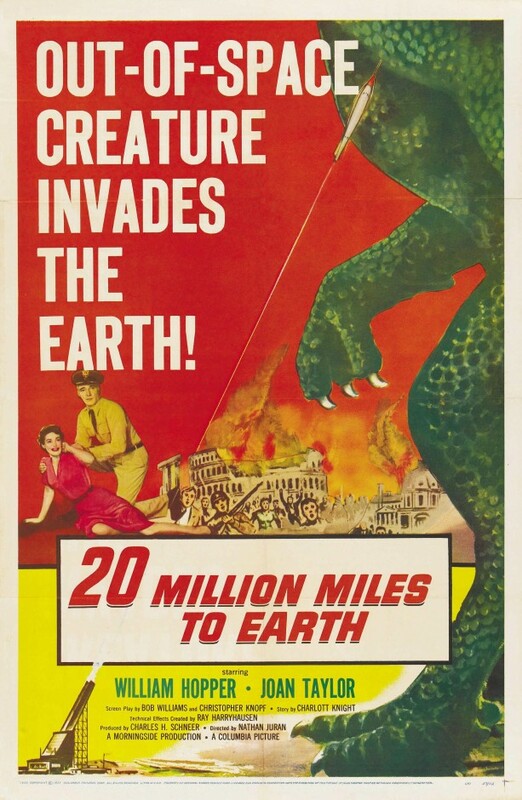 To celebrate this landmark film, and to mark what would have been Ray Harryhausen’s 97th birthday, the Ray and Diana Harryhausen Foundation will present a unique glimpse into the history and legacy of ’20 Million Miles to Earth’ (1957), featuring never-seen-before images from our archive. A rare screening of Foundation trustee John Walsh’s 1990 documentary ‘Ray Harryhausen- Movement into Life’ will then be shown, as a birthday tribute to the legendary animator. This will be followed by an exclusive big-screen showing of the restored ’20 Million Miles to Earth’, which was colourised under Ray’s supervision in 2008. This event will take place on 29 Jun 2017 at 6:30 PM; pre-booking is strongly advised. The evening will finish with a Q&A session, alongside an opportunity to learn more about the incredible Ray Harryhausen collection, and so is a must-attend event for film fans everywhere!